Since fitting the original 2 x 100 watt panels and controller I have had time to assess their performance as an additional battery charging facility. While I have been well pleased with the results, it was time to look towards possible optimisation of the system. The first area to look at was the spare capacity available in the charge controller. It is a 20 amp unit and the theoretic maximum the panels can produce is 16.67 amps. Having paid for 20 amps worth of control it seemed a good idea to use it. So extra panels were investigated. I knew that I could not fit any large panels due to lack of space but I thought I could wangle in a few small ones. So out with the tape measure and check the roof. 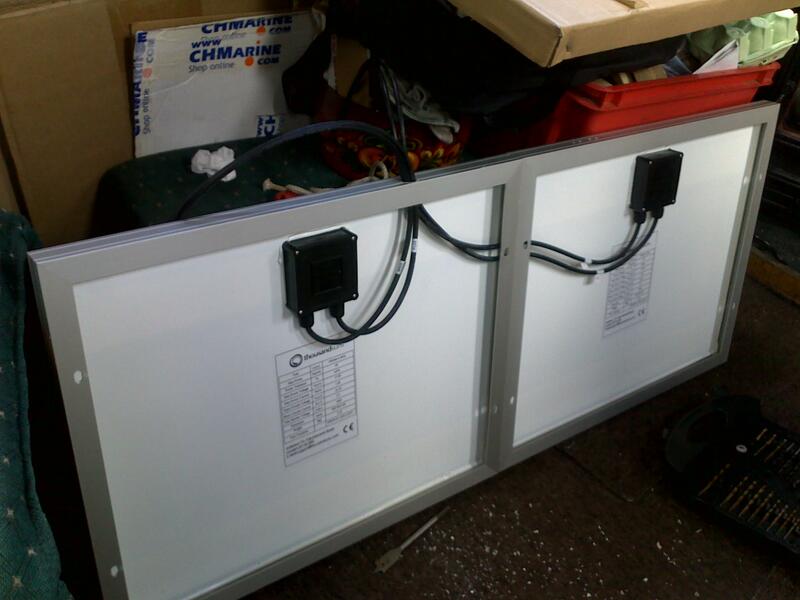 There was room for 4 x 20 or 30w panels (they are the same size) from the same supplier as the main panels. There is all sorts of discussion about mixing solar panels, most of it revolves around the fact that all of the panels will drop their output voltage to the lowest of the panels. 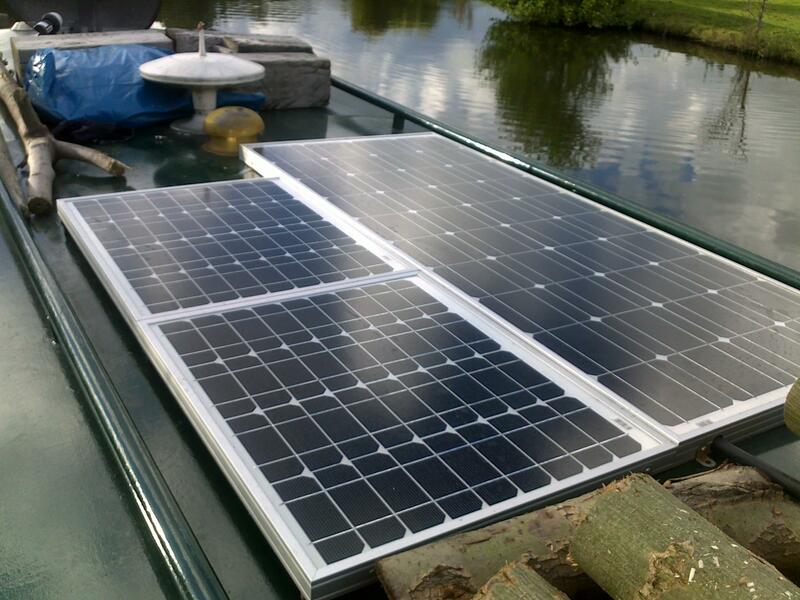 The panel supplier I used reckoned that I would lose about 10 watts by adding lower powered panels. I considered that a MPPT controller could sort it out as they are very smart, and part of how they work is by lowering the voltage. Of course, without serious measuring equipment we will never know who is right (hence the discussion in the first place). The second line of discussion was what was I measuring, total output of the panels or total input into the battery bank? The boat's systems have an overhead of 1.7 amps . Thus a 5 amp output from the panels would result in 3.3 amps being directed towards the batteries as 1.7 amps is being used by the inverter and other systems. My main concern is getting electricity into the batteries. So I played with a spreadsheet, adding 20,30,40,60 and 80 watts to the existing 200 watts (I wasn't planning on pushing my luck by mixing 20 and 30 watt panels). Obviously the more I added, the less the overheads mattered and the whole system became more efficient. One of the reasons for undertaking this exercise is that the panel supplier had sent me an email offering me a £25 discount. When I added in cost data then my price per amp showed a marked drop on the 60 watt (2 x 30) option. The full result was: adding 30% more wattage, gave around 50% more power into the batteries. The resulting increase in cost was an extra 20%. It was a done deal. I picked up the extra panels whilst cruising through London to save the P&P and started preparing them. For security they would be attached to the existing front panel so I hauled that off the roof and fixed them together. 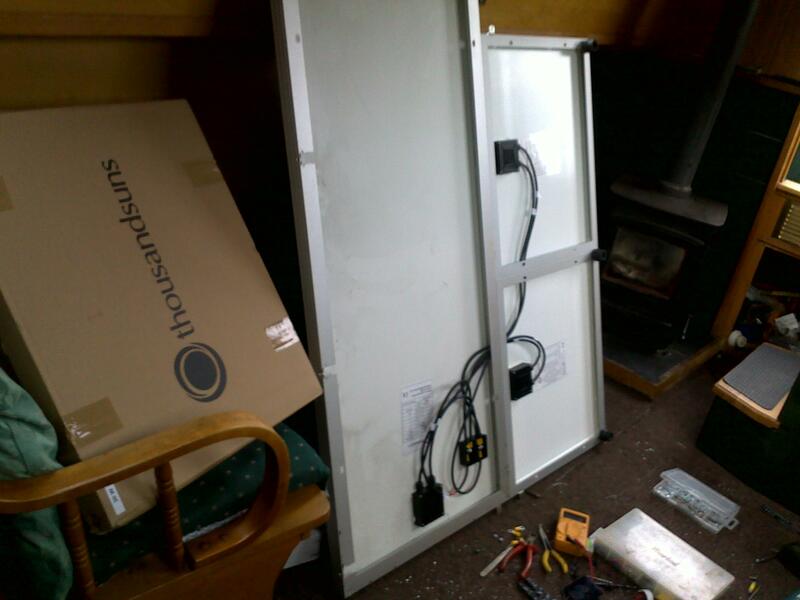 First the 2 x 30 watt panels were joined (each is 450mm x 541mm) to give a panel 450mm wide. 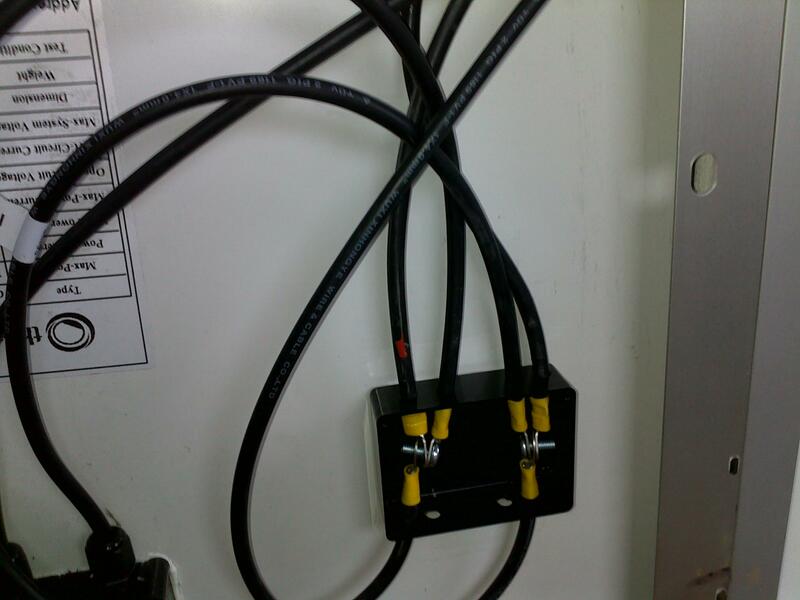 And as before, one of my home made junction boxes, ready to re-join to the main cable. All that was required was to re-fix it to the roof. And there they are in place. It does indeed work the way I expected it to. There is quite an uplift in the amps into battery. Is it 50%? I simply don't know as I really have no way of measuring it until I have clear midsummer skies again. Basically I have run out of roof space and peak controller capacity at this point and will stop there. All I can add is that the day before the Autumnal equinox we were stopped the whole day with a mechanical problem. We got all of our electricity from the panels, fridge, lights, PC and TV. There was no drain on the batteries over a 24 hour period. Before fitting the panels we would have had to run the engine/generator/charger system for at least an hour. The down side was that we had no hot water (except from the kettle) as the engine provides that as well. Results are now getting muddied by the weather, and the upgrade described above. The results are therefore less factual and more subjective. Solar panels need sunshine to work. That may sound like an obvious comment but it's very easy to confuse sunshine with light. Moored under a tree it may be light but the solar panels will produce little or nothing, whereas they produce a lot more in overcast conditions where only the clouds block the sunlight. Tangible results: 9 amps was seen as the maximum peak in the 2 weeks prior to the equinox (all figures are converted back to the equivalent of the original 200 watt system). It was a squeaky clean air day. The average peak is around 5-6 amps. The 4 o’clock figure was around 2 amps, and the panels went to bed, most days, by 6.30. Subjective results are influenced by the upgrade to 260 watts but are significantly better than the bald figures suggest. The battery bank is in far better condition than it has been for years. The trickle charger effect has pretty much renovated their state of charge. Certainly over day the discharge rate of items such the fridge is so much offset by the charge from the panels that it makes a much smaller dent in the available electricity from the batteries than before. As the last paragraph in the upgrade notes shows, on a good day (lightly overcast sun) even at this time of year the solar panels can provide all of our electricity. Let's see what the Winter brings!